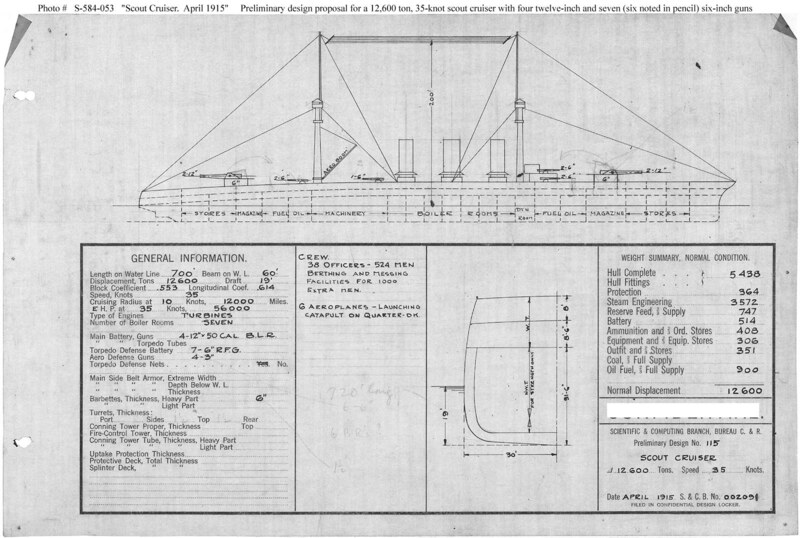 This plan provides four 12-inch guns and seven 6-inch guns and a speed of 35 knots in a ship 700 feet long on the load water line, 60 feet in beam, with a normal displacement of 12,600 tons. This design was adapted during early April 1915 from Preliminary Design No.112 (see Photo # S-584-050) by adding four heavy guns and 364 tons of armor on their barbette mounts at the expense of eliminating all hull side and deck armor, at the same displacement as design No.114. Preliminary Designs Nos. 113 to 115 were requested at the same time as an initial exploration of armament, speed, and protection options from the P.D. 112 baseline. Ultimately, however, no ships of this large type were built.